When my friend, Ellen, talked about the Whole30 eating plan last summer, I thought “It’s probably good for one’s body, but it’s not for me!” For those unfamiliar with the plan, it’s 30 days of eating only whole foods (vegetables, fruit, nuts, meat and fruit oils). During this time, one does not consume alcohol, sugar, dairy, grains, seed oils, and/or processed food. It Starts with Food explains why the authors advocate this way of eating, what they believe the health benefits are and how to stick with this eating plan. 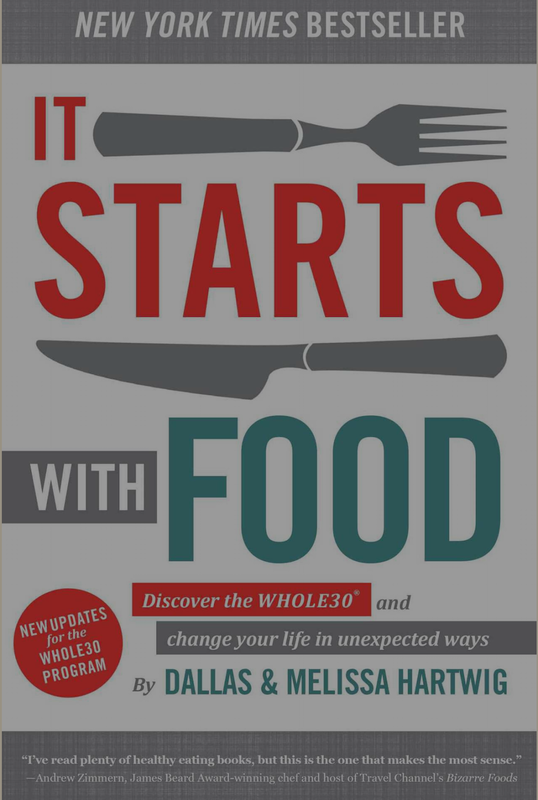 After reading It Starts with Food, I was ready to give Whole30 a try. Though I didn’t do it for 30 days (We had enrolled in and paid for a whiskey tasting class near the end of my 30 days, so I ended bit early. ), this eating plan was life changing. My skin looked much better, I lost a few pounds, my nasal congestion decreased and I slept better. Though I’m not prepared to eat this cleanly all the time, I’ve incorporated the principles into my life and view the banned foods as treats, rather than part of my daily diet. For me, reading It Starts with Food was a life-changing experience!